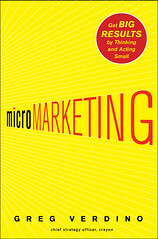 Danny Starr: Video Review of Greg Verdino's Book "MicroMarketing"
Video Review of Greg Verdino's Book "MicroMarketing"
In keeping with my 2011 New Year's resolution of doing more video work, I recently filmed a review of Greg Verdino's book MicroMarketing: Get Big Results by Thinking and Acting Small. This review was the brainchild of Glenn Schmelzle, an Ottawa-based marketing consultant to high-tech firms and principal of Marketing What's New. I'd also like to thank my friend Robert Decher of RDV Productions, for his video production and editing skills. microMarketing - A book review from RDVProductions on Vimeo. Here's a really quick summary of MicroMarketing: The world is no longer one massive market that you can approach effectively using mass-marketing techniques. Greg takes three main shifts we are seeing in the world (mass markets to micro markets, mass media to micro media, mass content to micro content) and expands them into seven shifts your company needs to be aware of in order to market in today's marketing space. As I point out towards the end of the review, there is a great interview with Greg about this book on the Marketing Over Coffee website. Marketing Over Coffee is a marketing podcast that both Glenn and I love. Glenn looks at the content of MicroMarketing through the eyes of a B2B marketer and outlines some of the challenges in applying the book's concepts. Glenn points out that the B2B marketer needs to think about generating unique content on a more frequent basis but that you need to keep an eye on sales cycles and how those will impact your marketing messaging. I take a look at the book's content from the point of view of a B2C marketer. While there are lots of great insight (like thinking about real-time marketing), I point out that Greg does a great job of expanding on the concept of paid media versus earned media. We hear about this frequently and Greg takes the concept of earned media one step further and cautions marketers to remember that earned media is not free, there is a cost associated with it and that earned media must really lead to earning attention. Glenn and I really enjoyed the book and it contains lots of case studies and examples, including links to lots of enhanced content which you can see on the MicroMarketing website. This was our first attempt at a video book review. Both Glenn and I would be delighted to hear any feedback you have in the comments on this post.